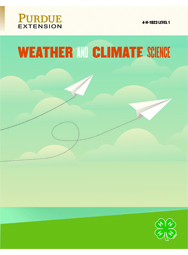 The 4-H Weather and Climate Science curriculum is for youth who enjoy learning about science, especially weather and climate. It is written in three levels with a facilitator's guide for each level. Level 1 introduces basic terms and concepts for youth in grades 3-5. Activities focus on understanding the signs of weather. 48 pages. Color.